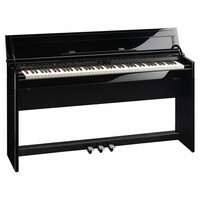 Rolands DP-90S Digital Piano is a stylish piano ideal for the modern home with the sound and feel of a timeless classic. This neat little piano is beautifully elegant and understated taking its place in your home as an attractive and high end piece of furniture. Rolands SuperNATURAL sound engine creates a spotless recreation of an acoustic grand piano whilst the PHA-4 Premium Keyboard has all the latest touch sensitive technology for rich tonal variation and dynamics.